Kentucky Derby Marathon and Mini-Marathon runners needed nourishment for the miles that lay ahead. When making lemonade from lemons, consider context. Never make lemonade for your diabetic aunt or for people with citrus allergies. You may inadvertently harm them. Similarly, if you’re an injured athlete who wants to run “just for kicks,” don’t race a half marathon in a polyester suit jacket. Not one to heed my own advice, that’s exactly what I did. 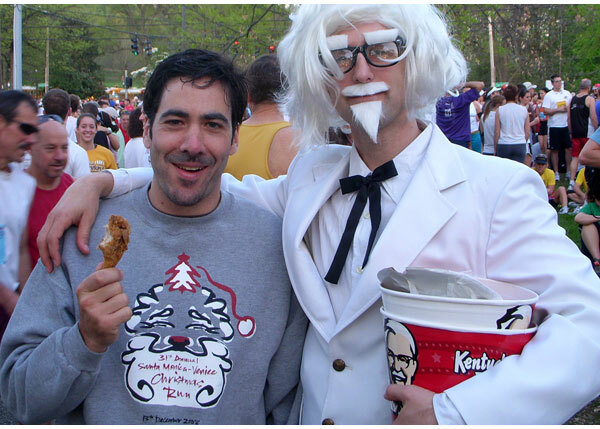 I ran the Kentucky Derby half marathon dressed as the inimitable Colonel Sanders. The man has achieved legendary status in Louisville. The plentiful lamppost banners and colossally gigantic downtown mural convinced me. He’s a big deal in this neck of the woods. I just don’t know how he handled the heat in that suit. Polyester doesn’t breathe in the best of circumstances, least of all in sizzling conditions. By 6 a.m. on race day, temperatures reached the upper 70s, perfect for sipping iced tea on your veranda, but punishing for a long distance race. I certainly didn’t have to wait long to feel the effects of the heat. Perspiration began in earnest on the bus ride to the starting line. During the race, I needed to stop occasionally to avoid getting dizzy (let alone extra crispy). Thankfully, I opted for shorts instead of trousers. The wig didn’t help. Besides oven-roasting my head, it made me look more like Mark Twain or Albert Einstein than Sanders. The shocking eyebrows completed the Muppet-esque caricature. Not content to simply look the part, I carried a bucket of the Colonel’s secret formula, original recipe fried chicken with me at all times. I convinced as many runners as possible to enjoy the deep fried goodness. I carried the bucket for the entire race, but I did not partake. As a personal rule, I never consume corn syrup solids and saturated fat during rigorous exercise. I also spoke in an aristocratic Southern accent. From the pre-dawn bus ride to the post race stretching routine, I embodied the Colonel. All older women were “young ladies,” fried chicken was the currency of champions, and gentlemanly Southern manners ruled the day. I didn’t race well, finishing with my slowest half-marathon ever (2:03:45). But it hardly seemed to matter. As the iconic Colonel, I enjoyed unceasing, vigorous crowd support, posed shamelessly for umpteen photos along the course, high-fived countless kids and had a lovely chat with Louisville’s courier-journal at the finish. For the record, I gave away all of the chicken by mile two, mostly to runners. This includes the thigh and leg I gave to the Elvis troupe. I had a wonderful time. Just what the doctor ordered.